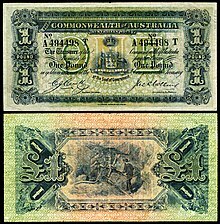 ^ a b c d Commonwealth of Australia (1963). "Chapter 20. Private finance" (pdf). Year Book Australia. Retrieved 12 Jul 2013. ^ Department of Foreign Affairs and Trade (Nov 2009). "Our currency". About Australia. Commonwealth of Australia. Retrieved 12 Jul 2013.